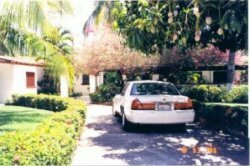 Welcome to our selection of holiday homes to rent in Mexico. Mexico is an increasingly popular destination with tourists from the USA and Canada, thanks not only to its proximity, but its mixture of sunny beach resorts and historical cities. Although some regions near the border are now more famous for organised crime, the vast majority of the country, including the main cities of Guadalajara, Monterrey and Mexico City, along with well-known resorts like Cancun, are perfectly safe for tourists to visit. There are dozens of flights a day between North America and Mexico, and more and more visitors are arriving from Europe, attracted by the beaches, impressive golf courses and fascinating heritage. Although the official language is Spanish, many people in the tourist areas will speak English. Home to several impressive buildings, such as the huge Metropolitan Cathedral and the Mexican National Palace, the capital Mexico City is also located close to some of the most popular ancient Meso-American sites in the country. The Pyramid of the Sun and the Pyramid of the Moon are Aztec buildings in the nearby settlement of Teotihuac�n. These amazing monuments are only slightly smaller than the Great Pyramid of Giza and several tour companies run trips from Mexico City if you don�t have your own transport. Guadalajara is more of a cultural destination, where visitors can enjoy traditional music, food and, of course, tequila! Considered as the home of Mexico�s famous mariachi music, the city also hosts other cultural events throughout the year, such as Mexican book and film festivals. Monterrey, the smallest of the three main cities, has plenty of historic charms, with much of the old town dating from the 16th century. There are several historical museums in the town, including the Museo de Historia Mexicana, while the attractive Macroplaza, with its monuments, gardens and works of art is one of the largest public squares in the world. One of the most well-known and popular beach resorts in Mexico is Cancun, located in southern Mexico over 1,500 kilometers away from Mexico City. There are some Mayan historical sites in the area, but most people visit Cancun for the white sandy beaches, warm weather, vibrant night-life and the golf clubs that are opening all the time to cater to US and European tourists. The more established resort of Acapulco, situated on the Pacific coast only 300 kilometers from the capital, remains popular. The north end of the bay is where you can find many of the older hotels and apartments, frequented by movie stars in the 1960s, while the southern section features more modern, high-rise developments. 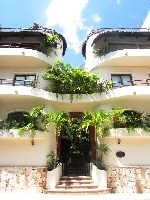 Looking for self catering holiday accommodation in Mexico? 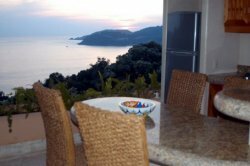 then below is a selection of villas in Mexico and apartments in Mexico that can be rented direct from their owners. You can either click on each listing for further details or you can use our search engine on the left if you are looking for something in particular.